In American music today it is very easy to get swept up in production. The bigger the production the better, some may say. Whether it's overwrought sound design or repetitive bass lines to autotune - the landscape of music is littered with casualties. And then you have something that comes out of nowhere and just throws everything off the rails and makes you take notice and this time it's in the form of a six piece band hailing from Durham, North Carolina called Delta Rae. The band has is made up of siblings Brittany, Ian, and Eric Hölljes along with Elizabeth Hopkins, Mike McKee, and Grant Emerson. From the get go, you notice that there is not a lack of talent in the Hölljes family and it seems as if they have some to spare. The describe themselves as, "Mumford & Sons meets Fleetwood Mac -- a full-throated Alt-Pop band with four lead singers -- delivering crushing harmonies and one of the most electrifying live experiences on the club circuit." 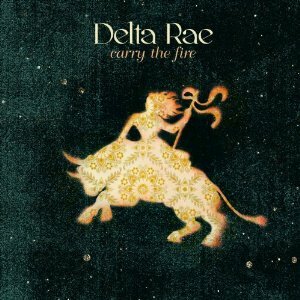 It is very easy to see the the comparisons because both bands have an earthy-ness to their particular brand of art and Delta Rae certainly have the same. On June 19th, they released their debut full length album, Carry The Fire and I couldn't be more pleased. They classify their brand of music as "Americana" because it has a little bit of everything and while I love this, I think the closest genre they have to accepting their style of music is going to be country radio (which there is nothing wrong with) but I think they have a sound that is more far reaching than simply country music. The ID3 tag on the MP3s say Alternative Rock and I think that still applies. The album has amazing heights and even higher highs. There is nothing better in this world, in my opinion than brilliant four part harmonies and they have them in spades. The album starts off with "Holding On To Good", and ode to doing the only thing you can sometimes when life throws you a curve and that's find the good and hold on to it with all you can. It, like many of the other tracks just builds and builds into a beautiful crescendo. Following next "Is There Anyone Out There", which may quickly prove to be my favorite song on the track because it is just expansive. It starts immediately and is just this blistering track that paints a picture in my mind of the last survivor of an apocalypse sending out a message on a two way radio looking for just another person for some form of human contact. I think it is much less apocalyptic and more grounded in realizing that there are times in our lives when we encounter trials and tribulations that they are much easier to over come if there is someone to bear the load with you. It also makes me feel like a reaction song to the attacks of Sept. 11, 2001 as in this horrible thing has happened when it shouldn't have and now we have to deal with it and it's new and it's raw and how in the hell are we going to cope. "Morning Comes" is our first example of Eric on lead vocals and it's another stunning example of the absolute beauty this group has to offer. It is lyrically sound and Eric's vocals are solid. Elizabeth is up next on "If I Loved You" and she certainly holds her own and stakes her claim as a rightful member of the group. I really dig this song as well and I think that most people may have been in one of this places at some time in their lives. What is probably going to be the song that will be the song that they are going to be known for is "Bottom of River" and don't get me wrong, the song is amazing but it's only part of who they are not the song that should define them. It's a stunning example of how minimalism in music can be achieved and how spectacular it can be. Britney has a ton of power behind her voice and she is able to easily control it to a degree of a very seasoned artist. Make sure you watch their performance from Billboard.com. The album is packed with example after example of how music is built from the harmonies to each little detail, such as the use of chains as an instrument to how many layers they can pack in each song. There are so many subtleties that you will hear something new every time. It's hard to say which songs are better than others because they all have something unique and interesting to them. "Country House" is the hopeless romantic of the group and "Dance in the Graveyard" is so uplifting. "Fire" and "Forgive The Children We Once Were" are just so different in their scope and execution. "Fire" is this driving force of nature that is powered on piano and Britney's vocals where the introspection and thoughtfulness of "Forgive The Children We Once Were" balances it out so evenly. "Surrounded" is full of melancholy and a bit of remorse and deals with ghosts of Christmas past; as it were. If you're looking for unadulterated desire then "Unlike Any Other" is your song. It has this sense of longing that you feel when you need that person that is missing out of your life. "Hey, Hey, Hey" is awesome because they share vocals and it showcases each of them brilliantly. It's just a super fun song and probably the best way to bring the album to a close. The album is simply incredible. It is a pleasure to listen to and to listen to again. You are going to hear something new everytime you listen to it and there are songs that you will immediately associate with different times and parts of your life. It is going to absolutely be in my Top 10 of the year. Probably my Top 5 even. You never knew you needed this album until now and I am telling you it is an absolute must for any fan of music. Oh.... this album came about via Kickstarter... Just another reason that Kickstarter is just amazing. Watch any of the live performances on youtube and be amazed at the passion they throw into any track. I can't wait until I get to see them live. Go buy their album. You need it. You definitely need to see them live! They're incredible! And I totally agree...this album is most definitely in my Top 5! They're amazing musicians and amazing people, and definitely deserve all of the attention they're getting! I can't stress this enough: No matter how much you like this album (and you will, if you like beautiful music), you really must see Delta Rae live. I've caught their show over a half-dozen times in the past two years, and it's amazing how quickly they've developed their stage presence (they've been performing for less than three years). They have an amazing combination of high energy and close rapport with their audience that belies their youth. It's also special to look around and see the range of their fan base--from teens to retirees, in every show and every venue. There is literally something here for everyone.